Meir ben Baruch was, most likely, in his late thirties when he arrived at the small castle town of Rothenburg ob-der-Tauber, a town that will become his namesake. He and his pupils quickly settled in what is now known as the Judengasse. A Yeshiva was promptly opened in his house for the local Jewish community and Meir ben Baruch quickly became known as one of the leading religious scholars of his time – Our Teacher and Rabbi Meir of Rothenburg, the Maharam (מהר”ם). His journey’s end in Rothenburg was triggered by events that took place in Paris, his former residence, a few years earlier. A chain of events that shook him, and European Jewry, to the core. Meir ben Baruch was born in the city of Worms at around 1215 to a Rabbi named Baruch a decedent, according to lore, of a long line of Rabbis leading all the way back to Rashi. Meir ben Baruch spent his early years studying under the leading Jewish scholars of the time, in Würzburg under Isaac ben Moses of Vienna, and in France, under Yechiel of Paris, Samuel ben Solomon of Falaise, and Samuel of Évreux. Paris, in the early 1200’s was a great Jewish center of learning and one of the foremost scholars of the time was Yechiel of Paris. Of Yechiel’s many pupils, one will later be called Meir of Rothenburg and the other, Nicholas Donin of La Rochelle. It is unclear if Nicholas Donin converted to Christianity in 1235 when he was officially baptized into the Roman Catholic Church, well after his excommunication by the Parisian Jewish community in 1225; or prior to it, as some historians believe. However, what is clear is that Donin’s rise to infamy began in 1235 as one of his first acts as a Franciscan was to take a leading role in the bloody Crusader persecutions in Brittany, Poitou, and Anjou, in which 3,000 Jews were murdered, and an additional 500 were forcefully baptized. Not three years later, Donin set off to Rome, presented himself before Pope Gregory IX, and denounced the Talmud. Thirty-five articles were drawn up, in which Donin stated his charges of virulent attacks on the Virginity of Mary and the divinity of Jesus. The Pope was persuaded that the accusations were true and dispatched to the authorities of the Church, transcripts of the charges formulated by Donin, accompanied by an order to seize all copies of the Talmud. If an examination corroborated the charges of Donin, the scrolls were to be burned. This papal order was largely ignored, except in France. Louis IX ordered all copies of the Talmud be confiscated under penalty of death in March, 1240. In June 17 of that year, four of the most distinguished rabbis of France—Yechiel of Paris, Moses of Coucy, Judah of Melun, and Samuel ben Solomon of Château-Thierry were ordered to answer Donin in a public debate. We know that Meir ben Baruch was a pupil of two, and perhaps three, of these famous Rabbis at around this time and, as some believe, personally witnessed the following account. It goes wihout saying that all of the debates in Europe at this time were losing propositions for the Jews, if they won they lost and if they lost they lost; effectively making it a show trial and not a debate at all. Nevertheless, Yechiel of Paris made a skillful defense and Louis IX agreed that it was true that one could not prove Christianity through the Talmud. It did not prevent him, however, to declare that the Talmud is an insult to Christianity and all copies must be burnt. 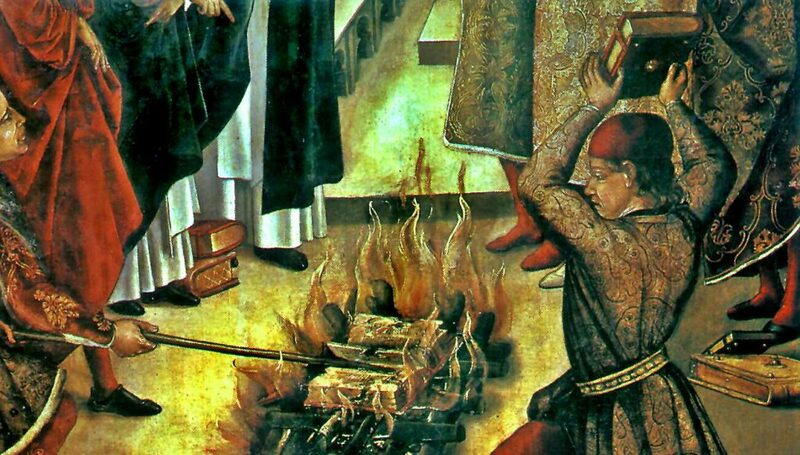 In 1242, Louis IX ordered the burning of 24 cartloads of priceless Hebrew manuscripts. These 24 cartloads amounted to some 12,000 volumes; and one must bear in mind that in the Middle Ages each book was painstakingly hand-written. The Talmud in today’s format, is over 2,000 pages long; pages written with quill pens and self-manufactured ink on parchment. The pure physical labor of sitting and writing that volume of words alone is mind boggling. And thus with a strike of the flint, generations-worth of wisdom, cultural heritage, tradition, and the life’s work of many were turned into ashes. The Disputation of Paris and the burning of the Talmud effectively marked the end of the Jewish community. Louis IX then followed it up with an expulsion of the Jews from France — after despoiling them, and taking away their money and property, of course. The Jewish community in France never really recovered. It never again became the great seat of learning or even the great seat of Jewish tradition as it was in the 11th through 13th centuries. For his efforts, the Church canonized Louis IX as a saint in 1297. He is the Louis after which the American city and baseball Cardinals are called. Yechiel of Paris gathered some of his followers and headed for Jerusalem which its environs at the time were mostly under Mongol rule and religiously tolerant. His community would later be massacred and wiped out by the Mamluk conquest of Acres in 1291. Following the Paris Burning, as it is known in Hebrew, Meir ben Baruch wrote a kina, or a lament, called שַׁאֲלִי שְׂרוּפָה בָּאֵשׁ which is sung to this day by Ashkenazi Jewry on Tisha B’Av. After the burning of the Talmud, Meir Ben Baruch headed back east for his hometown of Worms and then on to Rothenburg ob-der-Tauber. He would later be the center of another chain of events that would also have a lasting effect on world Jewry, and Israeli politics, to this day.